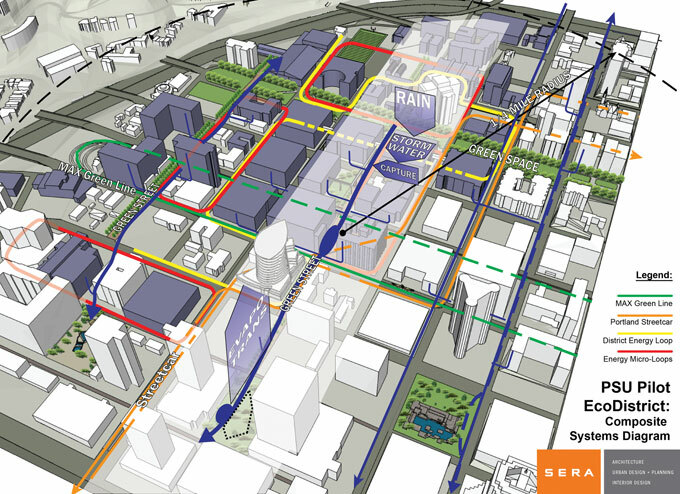 SERA is working with Portland State University as one of five pilot EcoDistricts designated by the Portland Sustainability Institute in a program aimed at removing institutional barriers to creating sustainable neighborhoods. The team is looking at cogeneration, waste-to-energy, lots of heat exchange among the energy strategies they’re hoping will help them get to net-zero. Achieving a net-zero building with today’s technologies and occupant expectations is hard. There are a handful of projects out there proving that it is possible—for the right building in the right setting with the right team. But sometimes going after the goal of net-zero energy use in the building can have unwanted side effects. For example, a low-rise building on a low-density site will have a better chance of being net-zero with onsite renewables, but that type of development is often known as “sprawl.” The investment in dollars and resources to get to net-zero are significant and might be better spent on more cost-effective energy saving options, such as a more efficient building envelope or creating a district energy system that can serve an entire campus. For all those reasons and more, some argue that while both have an important role to play, it’s more useful and important to work toward net-zero energy communities rather than net-zero buildings. Individual high-performing buildings don’t mean so much if the neighborhood as a whole is wasteful, while if an entire community is net-zero, that’s meaningful even if the individual buildings within it are not. Net-zero energy is an ambitious goal for any building—one that can’t be achieved without scrupulous attention to every aspect of a building’s design, construction, and operation. Like the related goal of creating a carbon-neutral building, any net-zero building has to first achieve significant load reductions and system efficiencies, and then meet the remaining loads with onsite energy generation. In some ways, net-zero is a tougher goal than carbon-neutral: By most definitions, a project could become carbon-neutral using biofuels from off-site—that’s not as widely recognized a solution for achieving net-zero. On the other hand, carbon calculations often account for the energy and carbon expended to create a building—its embodied carbon—which is not usually the case with net-zero energy. Most buildings that generate their own energy do it with solar photovoltaics (PV). 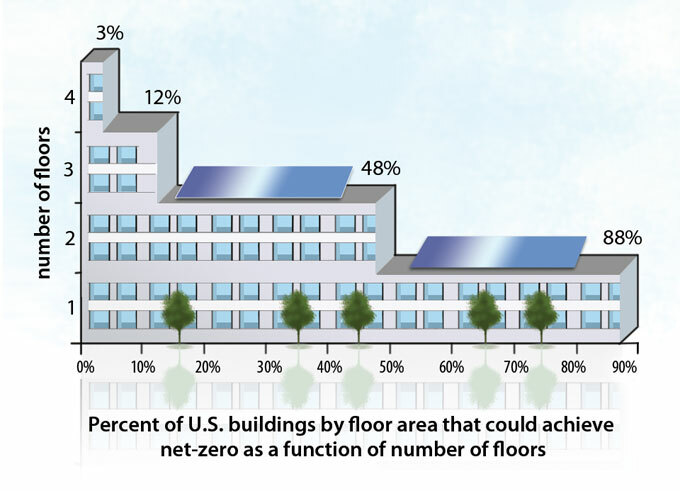 If we assume that a building has only its roof area available for mounting PV, then a single-story building is much more likely to achieve net-zero than a high-rise. A 2007 report from the National Renewable Energy Lab (NREL) and the U.S. Department of Energy (DOE) analyzes the potential for buildings in the U.S. to achieve net-zero energy using energy technologies—both for energy efficiency and PV—that they expect will be widely available in 2025. The graph below shows how their predictions play out based on the number of stories. Getting to net-zero is extremely difficult for buildings of more than four stories. If the project includes energy-intensive data centers, labs, or other spaces, the challenge gets tougher. 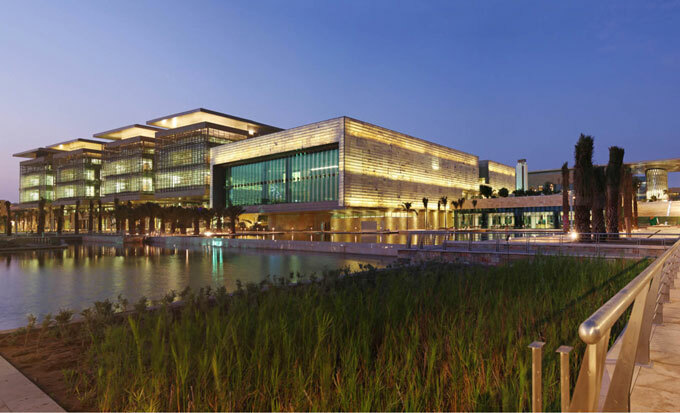 The King Abdullah University of Science & Technology (KAUST) is a new 5.3 million ft2 (500,000 m2) campus in Saudi Arabia designed by a team led by HOK. The $20 million dollars spent covering the roof in roughly 400,000 ft2 (37,000 m2) of PV and solar thermal provides about 7.8% of the total campus energy use. That’s not nearly as cost-effective as the free 3%–4% overall energy savings achieved by changing the chiller utilization controls, notes HOK’s Colin Rolfing. Controls also help campus-wide. The Inter-Campus Automation System (ICAS) helps take advantage of the diversity of energy loads by sending excess electricity, chilled water, and steam from the solar panels and from the central utility plant to buildings that need it the most. Transportation isn’t the only impact that is often (but not always) ignored when focusing on the building. The energy and environmental costs of supplying potable water and treating wastewater, providing energy and data infrastructure, and creating roads and transportation systems are all beyond the scope of most buildings, yet necessary to support their functions. The Living Building Challenge, created by the Cascadia Green Building Council and now managed by the International Living Future Institute, is the rare exception that accounts for these impacts by stipulating zero municipal water consumption and wastewater discharge, and requiring that all buildings be located on previously developed sites. Version 2 of the Living Building Challenge, released in 2009, goes even further in this broader focus by requiring a focus on design for “car-free living.” It also anticipates the importance of reaching beyond the individual building with the concept of “scale jumping,” which allows project teams to link buildings together to achieve the requirements as a group. Neighborhoods and communities, being larger than individual buildings, can support many technologies for low-impact heating, cooling, and electricity generation better and more cost-effectively. To some extent, this is simply a matter of scale: combined heat and power systems—especially those using biomass—are more efficient in larger sizes. Perhaps more important, they can support dedicated operations and maintenance staff to keep them working properly. The same is true for community-sized boilers, chillers, and many other high-tech solutions. Many colleges and universities already have centralized energy infrastructure, as well as an entire community under common ownership, making them natural candidates for becoming net-zero. “University campuses are going to be the early adopters in this game,” says Eric Ridenour of SERA Architects in Portland, Oregon, citing long-term ownership of their buildings and access to patient capital (as opposed to investment funds seeking a quick return). One example of a community-scale cooling system that would not have been feasible for an individual building is Cornell University’s deep-water cooling system in Ithaca, New York, using water from Cayuga Lake to replace three existing chiller plants. Reaching two miles out and 250 feet into the lake for cold water, this system cost about $60 million, some of which would have been spent anyway replacing chillers and CFC refrigerants. It saves about 25 million kWh annually, reducing Cornell’s total electricity bill by 10 percent. Source: “Economic Investigation of Community-Scale Versus Building Scale Net-Zero-Energy,” S. Katipamula et al., December 2009. U.S. DOE report #PNNL-19095. • and wind turbines on purchased land. They were surprised to find that, on a cost-per-kWh basis, wind on leased land was the winner even in Phoenix, which has abundant sunlight and a relatively poor wind resource. PV on individual buildings was the second-to-last choice in both cities, beating only solar thermal electricity in Chicago, and wind on purchased land in Phoenix (see graph). Communities also have a mix of occupancies and uses, which can support more efficient use of infrastructure and cascading uses of energy. Offices use most of their energy by day and can go dark at night, while for residences it’s just the opposite. That means that a single heating or cooling plant serving both can be not much bigger than a plant serving just one of them. It is also sometimes possible to share energy—using waste heat from data centers, for example, to heat water for use in apartments. Looking into the benefits of this diversification for neighborhoods in Portland, Oregon and Seattle, the architecture firm Mithun found the ideal mix of residential to commercial uses to be 75% to 25%, according to president Bert Gregory, FAIA. Mithun and engineering firm Arup are now designing new mixed-use facilities for a state office campus in Baltimore, Maryland, and exploring potential synergies. One discovery they made is that they can get many of the benefits of a central heating and cooling plant with equipment distributed in the basements of several buildings by linking the equipment together into a “virtual central plant.” That solution gives them the benefit of modular equipment, so each device can come online as needed and operate at optimum capacity. More important, it solved a phasing problem by removing the need to invest in a large central plant before all the demand was in place. Criterion Planners of Portland, Oregon, has estimated that a full 25% of the building energy savings in a prototype LEED for Neighborhood Development community can come from district systems, including both plant efficiency and peak load diversity. Another 10%, in their model, comes from the increased density. In Freiburg, Germany, the Vauban district is recognized internationally for its efforts to discourage car ownership and promote alternative transportation. This 5,000-person community, built on a former French army base abandoned in 1992, also has highly efficient buildings. 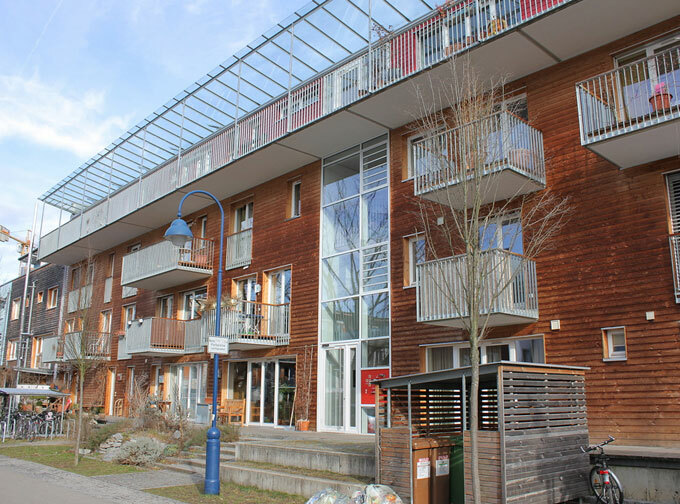 Over 100 are built to the Passivhaus standard, and the “Solar Settlement” neighborhood boasts 59 “Plus Energy” houses, designed by architect Rolf Disch, that generate more energy than they use. Most of the community’s remaining energy needs are supplied by a biomass-fired cogeneration system. A net-zero-energy community is not simply a collection of buildings that, taken together, achieve the goal of net-zero-energy. A community includes loads and energy uses that are not often included in the equation for individual buildings, such as wastewater treatment and other community infrastructure, not to mention designing to support low-impact transportation options. These represent opportunities for environmental gain that extend well beyond energy efficiency, including water conservation, rainwater infiltration to reduce runoff, the social benefit of reduced car dependence, and even urban agriculture for a local food economy. All of these infrastructure and planning-scale issues directly or indirectly involve energy use: wastewater and stormwater treatment have energy costs for the city; transportation and transporting food both require fuel for vehicles. They are also tied into quality-of-life issues that are best addressed at the neighborhood scale—by creating spaces that make dense, urban living appealing, for example. The Irvine, California, consulting firm CTG Energetics has created a sophisticated community-impacts calculator that aggregates data from a range of sources, including energy models of typical buildings in the community, transportation models, and water-related energy use, to quantify the impacts of community design choices. By addressing infrastructure in addition to individual buildings, and resources beyond energy, it gives project teams a framework for considering tradeoffs and avoiding the pitfall of too narrow a goal. For an individual building project, site constraints and preexisting street grids may make it impossible to orient the building for optimal daylighting and passive solar heating or cooling. “As much as 50% of the heating and cooling energy can be saved by going from the worst orientation to the best orientation, and street layout has a tremendous impact on the orientation of buildings,” said Norbert Lechner, architect and professor emeritus at Auburn University. When designing at the community scale, those considerations can be addressed in ways that help make the individual buildings more efficient at minimal cost. The best example of this is Village Homes in Davis, California, where all 200 houses are on east-west streets even though the parcel of land is mostly north-south, according to Lechner. “Not only does every house save energy by receiving mostly winter sun and little summer sun but the cooling systems are also smaller and less expensive,” he said. Village Homes was built in the 1970s with a focus on solar design of individual homes and innovative stormwater management, but it doesn’t appeal to transportation-minded planners today, who see it as yet another example of a car-dependent, suburban neighborhood. Despite all the advantages, there are many reasons why community-scale approaches are not more common. 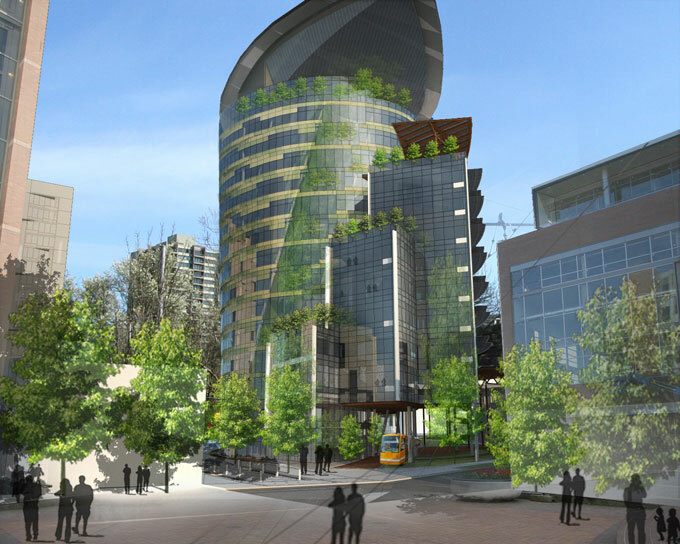 Large, developer-led, mixed-use projects such as Dockside Green in Victoria, British Columbia, or London’s Beddington Zero-Energy Development (BedZED) consolidate the ownership and management into one entity, so that they can coordinate design, construction, and management of an integrated project. There is even greater potential in revitalizing existing urban neighborhoods, but doing that introduces many new challenges. Mithun has explored several projects that could become urban ecodistricts, linking together many different buildings and uses, owned by separate entities, into a coordinated network. In the process, they’ve discovered a range of challenges. Who owns the infrastructure that’s needed to share utilities? How do you create governance structures that encourage private investment while coordinating it in a way that optimizes community-scale design? How do you get permission to connect buildings across public streets? And what do you do about utility regulations that make it difficult to create small, neighborhood-scale utility companies? Without a single owner to be accountable and responsible for these systems, all kinds of legal and commercial problems emerge. Most large, mixed-use projects are created in phases rather than all at once. That makes it hard to invest early in efficient, centralized infrastructure such as HVAC systems, transportation networks, and ecological wastewater solutions. But if those systems are not in place early on, then individual buildings and units have to build separate systems to meet those needs, creating obstacles to doing centralized systems later. Financing those investments before there is a critical mass of occupants to use them is a key challenge for many large projects. The more sophisticated systems that are possible in a community-scale project require dedicated management, so there has to be an organizational infrastructure in place to support the physical infrastructure. This problem gets even worse for communities that are pursuing the goal of net-zero energy, because they tend to seek out the most advanced technologies available rather than the tried and true. At BedZED, the combined heat and power system using biomass never worked as advertised and was replaced by gas boilers after a couple of difficult years for residents, who endured winters with limited heating. The onsite wastewater treatment system also failed repeatedly. Overreaching for unreliable technologies is one problem, but any large, mixed-use project lends itself to complicated systems and potentially unwieldy design and construction, warns Mithun’s Sandy Mendler, AIA. “Added size sometimes creates complexity that pushes against the efficiencies of scale, and there is an extra coordination effort when a large team is involved.” That complexity gets even worse when there are multiple owners and regulatory agencies involved. 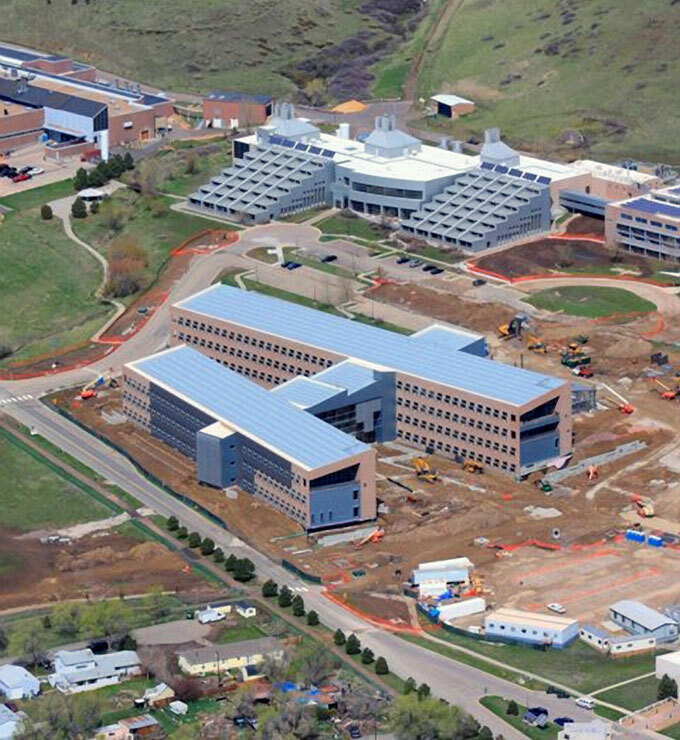 The National Renewable Energy Lab’s new 220,000 ft2 (20,400 m2) Research Support Facility is designed to be net-zero, with predicted energy use of 32 kBtu/ft2 (3 kBtu/m2)—to be offset with PVs on the building and in the parking lot. Clark Brockman, AIA, of SERA, acknowledges that net-zero individual buildings may not be the right goal: “I don’t believe that we’re ever going to get to a time when all the buildings are net-zero,” he says. But he does believe that every designer should have the experience of creating a net-zero building, because until they’ve done that they won’t understand what it means to design to absolute, physical limits. “It will change the way you work,” Brockman says. Any model for net-zero communities assumes that the buildings themselves, while not necessarily net-zero, are extremely energy efficient. A risk of focusing on the community is that the efficiency of individual buildings will get short shrift. This fear is corroborated by conversations Mendler has heard among the team working at the University of California’s new green campus in Merced, suggesting that they needn’t push the efficiency of individual building envelopes as much because the central plant is so efficient. This dynamic can occur any time a centralized solution is perceived to “solve the problem” for the project. Every net-zero-energy project depends on the full participation of its occupants to get that way. “In the case of individual buildings, the onus is on the owner or occupants to balance consumption with generation,” notes University of Florida’s Charles Kibert, Ph.D. “I don’t see this as achievable at larger scale because we are back to the ‘commons’ again—there is no vested interest for all the individual recipients of energy to limit their consumption,” he adds. The Oregon Sustainability Center, intended to serve as a hub and incubator for sustainable enterprises near Portland State University, is seeking Living Building certification. The design was scaled back from 230,000 ft2 to 200,000 ft2 (21,000 m2 to 18,500 m2) based on feedback that it could not achieve net-zero at the intended size. It has since evolved further, to 150,000 ft2 (14,000 m2). The project team for the Oregon Sustainability Center—a 200,000 ft2 (18,600 m2) multi-tenant project pursuing Living Building certification in Portland, discovered just how critical the occupants would be when they broke out the energy loads in their net-zero-energy model and found that occupant loads accounted for a full 50% of the energy use. “That changed the whole game,” says Brockman. “Now we have an entire section of our energy model that is devoted to occupant behavior,” he adds, noting that in addition to predicting usage schedules and thermostat set points more precisely, they also have to codify those assumptions for the tenant guidelines. Brockman isn’t daunted by the need to expand that level of occupant engagement to the community scale, however. He envisions a “fractal dashboard” model, with outputs at various scales displaying actual performance in real time at different levels of detail, from the community all the way down to the individual occupant. Net-zero communities won’t be achieved without effectively driving down energy use in each individual building—it’s just that not every build ing will get to net-zero. “The right scale is the scale that you have before you,” says Muscoe Martin, arguing that it’s better to do what you can within the scope you’re given than to do nothing at all. At the same time, he notes, it’s useful to think in terms of “nested scales” and consider the impact of your project on the products and systems within it, and on the systems in which it fits. Every project should help make its neighborhood more pedestrian-friendly, for example, even if it can’t redesign the entire streetscape. Net-zero is a compelling goal, both for individual buildings and for communities. Like any generic goal, however, it has to be applied wisely. “There is no question that you have to focus on every individual building because you want to drive down the loads as much as possible,” says Malcolm Lewis, president of CTG Energetics. “The trap is thinking that you have to make each building completely self-sufficient, because in doing that you sacrifice opportunities.” Some buildings won’t get there—so how do you set equally compelling targets that those buildings can achieve? Other buildings might get there, but with unfortunate side effects, such as increasing car-dependence. In those cases it’s important to expand the scope of the challenge to include transportation impacts and other community level impacts, and optimize the design based on a wider view of the goal. It’s not all about technology and design, however. No matter how cleverly they are built, we won’t have net-zero buildings or communities unless we change the way that we live and work in them. That’s a challenge that we’re all facing together. Describe several unintended consequences of focusing on net-zero-energy buildings. List at least three advantages of pursuing net-zero-energy neighborhoods (rather than buildings). List at least three challenges with pursuing net-zero-energy neighborhoods. Describe several strategies used in the net-zero-energy projects. 1- Net-zero is very difficult for buildings of more than four stories. 2- PV system is too expensive especially in undeveloped countries. 3- Best orientation can save up to 50% of heating and cooling energy. I think to get community net zero we need community solar + solar roof leasing. To get costs down we can have folks buy shares of solar, something like solar mosaic or buildings can lease out all their roof space as well. We also need to consider district water catchment and remediation when designing neighborhoods for solar. I can designing in living machines that add energy use be offset by the solar? Wow, great comments, Scott! Thanks for sharing based on your hard-won experience! How do you recommend dealing with the NZEB goal for project types that just can't get there with current technology? 1. NZBs are the right scale of improvement relative to the scale of the climate challenge. Incremental improvements will take too long, a paradigm shift towards zero is necessary, at both the building AND the community scale. The Stabilization Wedges analysis convinced me that we need multiple large scale approaches. 2. The building design process is often a good venue to take on a big issue like a NZB: you have the attention of the leaders of the organization, talking about their vision and goals, they have a significant funding stream in place, and they have a talented integrated design team helping them. 4. NZBs are something most of us can act on now, and speed is critical. The really interesting community scale work is impressive and very important, but the barriers have been challenging in our experience. We certainly need more Planning, but our client’s are usually need a single building. Other sustainability issues may actually be easier to address at the community scale due to existing institution structures: transit, water, stormwater, etc. 5. NZBs have cost less than I expected. In a half dozen projects the cost for the PVs (after efficiency strategies) have ranged from 1.5 to 6% of construction cost. Not insignificant, but we routinely have to VE more than this out of projects. The cost of retrofitting these buildings to NZBs will be MUCH higher. 6. NZBs clearly link new consumption to new supply. We’ll need to use new community scale renewables for existing buildings, and there will have to be a mechanism for the many new projects that won’t make sense as NZBs--but it needs to be a genuine mechanism, that forces the owner and design team to push just as aggressively on efficiency as a NZB goal does. 7. We’re in the learning phase now, with early adopters trying to figure out how to achieve NZBs for different building types, climates, etc so they can be more readily replicated. We need to advance the state of the profession quickly, so we need a lot of teams learning by doing. Global Green's work on two net-zero electricity affordable housing projects (see case studies at: http://www.globalgreen.org/publications/greenurbanism/archive) has led us to develop a rule-of-thumb about residential building heights and net-zero buildings for California's climate and solar exposure. Until some massive technological breakthrough in solar PV efficiency, 2 stories is your max if your units are air conditioned. Without AC, 4 stories is your max. This lead us to worry that the push for net zero residential buildings by code in CA by 2020 could result in sprawl and densities that do not support public transit. Maybe taller buildings should get to go down further on the NREL rigor scale, allowing offsets? On the behavior side, identical units in terms of size, orientation, and equipment (including appliances and lighting) are showing differences of up to 600% in electricity consumption. The lowest consumers use 6 times less electricity on an annual basis than the highest consumers. In-unit feedback devices have no significant impact. We attribute most of this to plug load -- that is, how many X-boxes, flat screens, computers, Wii, cell phone chargers, etc., etc. you have plugged in and on 24/7. In this case, net zero is about consuming less electronically and increasing the efficiency standards of electronics. I'd love to hear what others have to say about the interrelationships between behavior and design as it relates to the pursuit of super-low-energy buildings and communities. And thanks for pointing out that embarrassing mistake regarding Dockside Green! It's fixed now. Nadav, the last paragraph about occupant behaviour needs further exploration because behaviour drives design and vice versa. For example, at a recent charrette in India for a net-zero house that I helped facilitate, we learned that we couldn't just cover the roof with PV because occupants expected to use the cool night roof as a sleeping space in the hottest season. Had we done so, the occupants would be forced inside to use the A/C in the bedrooms, regardless of preference. By finding other locations for the PV, it enables occupants to choose to use the roof and avoid A/C use. Great article. I am in favor of net zero buildings but recognize the need for scale jumping to enhance the performance of our existing building infrastructure. While I have never worked on a NZE building project I can see that it would be transformational for the team and the occupants. More of this is needed and as it becomes the norm it will push communities to look at becoming NZE neighborhoods. The challenges of shared ownership, governance, and guaranteed monopolies by the utilities are real and large, but not insurmountable if enough voters start asking for changes. We are currently working with a community in New England to develop a Net Zero community action plan, and the idea that not all buildings can be net zero is a dangerous one. While it is technically true for some specific projects, it is also something that many who are unfamiliar with how achievable net zero can be assume to be true for the majority of buildings. More and more buildings are achieving and proving net zero (positive) energy is possible, and we need to do a better job promoting and highlighting those successes while at the same time acknowledging the need to find scale-jumping solutions for the community. This article does a good job laying out the pros and cons for different net-zero energy scales. Of course when we are designing for energy efficiency we should be zooming out as far as practical to have the greatest impact on energy use. The scale jumping feature of the Living Building Challenge is one such tool which acknowledges the benefit of shared infrastructure. The article very much relates to the concept of "conomy of scale". A bigger impact and a more broader change can be braught with larger developments in general. While the theory of 'do what you can, however small it may be' still applies, the fact is that the world is facing unanticipated climatic changes at a global level. To deal with these global changes larger scale responses should be given more importance. Also, at the end we are talking about the ecosystem, which is a conglomeration of many facets of living environment. A single home does not make an ecosystem but a large neighborhood does to an extent. This is a great article covering the multiple faucets of a net-zero community. It seems this is something that could fall under a developments HOA fees to make it more of a community efforts, but controlling who involved manages the systems. Students Move into "Largest Net-Zero Community" in U.S.